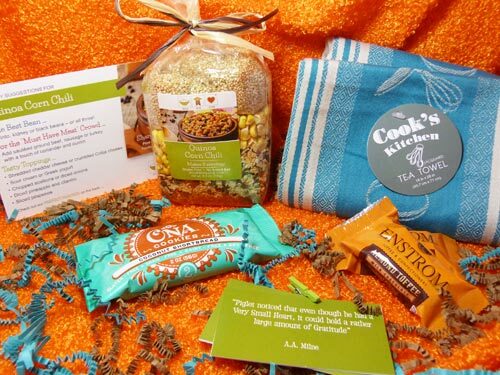 Special Soup Box subscription box is packed with Gourmet Goodness that Gives Back! Every SoupBoxLove order includes an artisan small batch dry soup mix specially chosen for the season and celebrations, news about the nonprofit you have supported with your order, a recipe card with savory suggestions … and a sweet or savory surprise treat (sometimes both)! 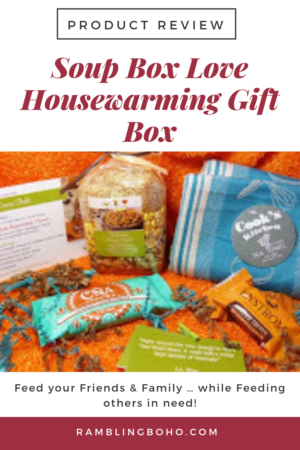 Soup Box Love is an awesome box to either subscribe to, or give to someone as a gift. Not only do you receive awesome soups, snacks, lifestyle items, and/or goodies, you are supporting a great cause… feeding the hungry! How can you say no? To make it even more irresistible, House-Wise has an exclusive promo code for you! Use code LOVEHOUSEWISE and SAVE 10% (as of this date). Go to Soup Box Love to subscribe today! We received the Housewarming Box for review. I have to say, the presentation was just absolutely outstanding! So beautiful. A warm welcome to your new home (or someone else’s) … soup from the heart! Every soup is made with the finest vegetables, grains and spices to create the highest quality, all-natural seasonal dry soup mixes (Gluten Free, non GMO, Kosher certified, no salt added). You get 8 full servings of soup in every amazing package of gourmet dry soup mix. The soup came beautifully packaged, layered style. Additional ingredients needed to make the soup are 8c chicken or vegetable broth, 1-2 cooked (canned) beans, and 1 lime. 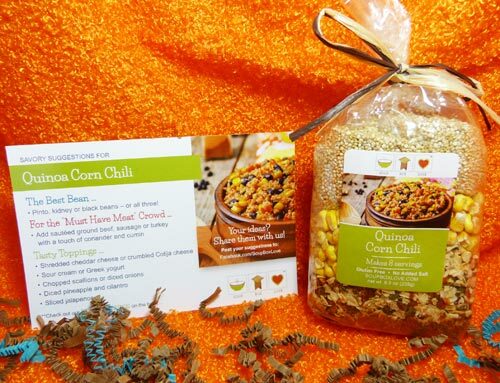 A wonderful mix of whole grain goodness, non GMO corn and balanced blend of spices. The recipe is simple. It comes with suggestions to add sausage or zucchini, but I think plain is great as is. If you love the soup that came in your box, occasionally you can purchase more on their site! This is one side of the enclosed Cook’s Kitchen jaquard tea towel. It’s made by Kay Dee Designs, and is of nice quality. It is quite heavy and is 18″ x 28″. 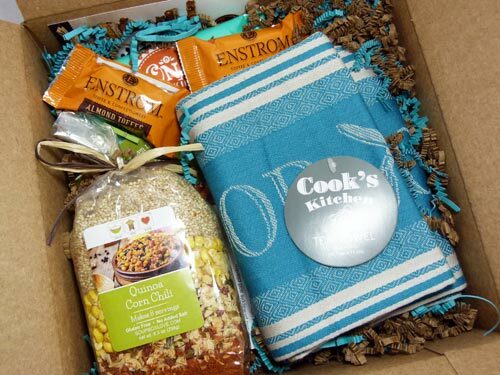 You can order a soup Box Love subscription for yourself, or as a gift. Either way, I think it’s a great idea! 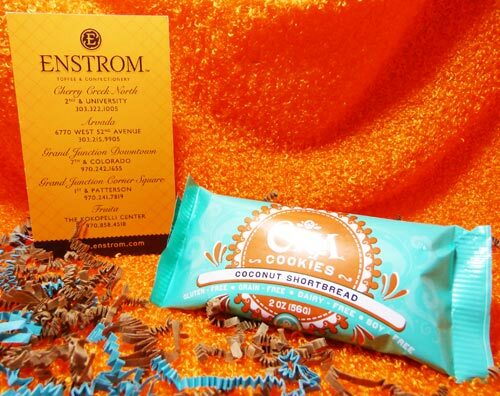 Some of the Gourmet goodies we received were from another local Colorado company, Enstrom. 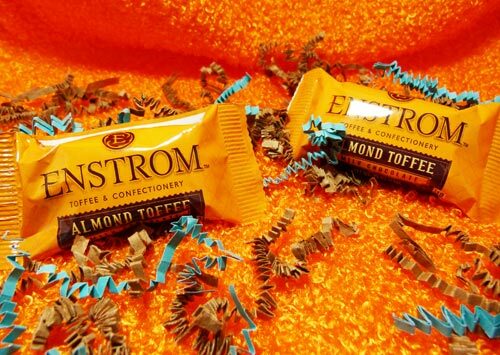 You can find them at several locations in Colorado. The other treat we received was from another local Colorado company, WB Kitchen from Fort Collins. ONA Cookies. Coconut shortbread cookies t be exact. Oh my, it was just sooo good! I could live off these. OK, not really, but I’d want to! The inclusion of these local treats in the Soup Box Love was just perfect! Also included were these cute little quote cards! 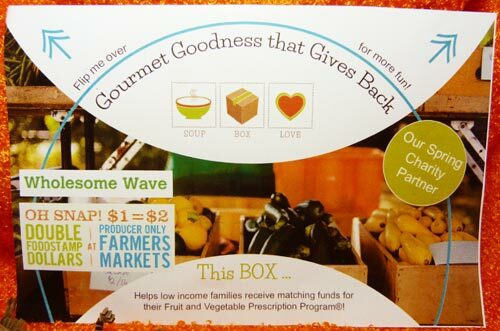 Proceeds of every order of their artisan, small batch soup mixes help hungry children and families. Help give underserved families access to affordable fresh fruits and veggies at local Farmers Markets! 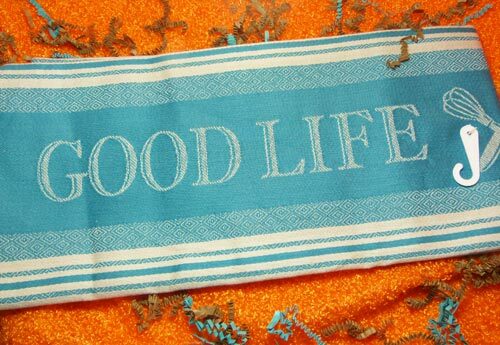 Proceeds in March & April proudly support Wholesome Wave. Their Fruits & Vegetable Prescription Program helps low-income families receive matching SNAP benefits funding to spend at local Farmers Markets. An underserved consumer put 2 servings of fresh fruit and vegetables on their dinner table every night for a week. SoupBoxLove ships to all 50 US states. We also ship to US territories and all provinces in Canada for an additional flat rate shipping charge of $5 (as of this date).